Dice sweet potato into 1 inch pieces and place on a baking sheet. Drizzle over with 1-2 tablespoons of extra virgin olive oil. Sprinkle over sea salt, black pepper and 1-2 teaspoons of rosemary or hermes de provence (to taste). Mix. Roast in a 400F oven for 45 minutes or until the sweet potato is golden brown and soft when you insert with a fork. 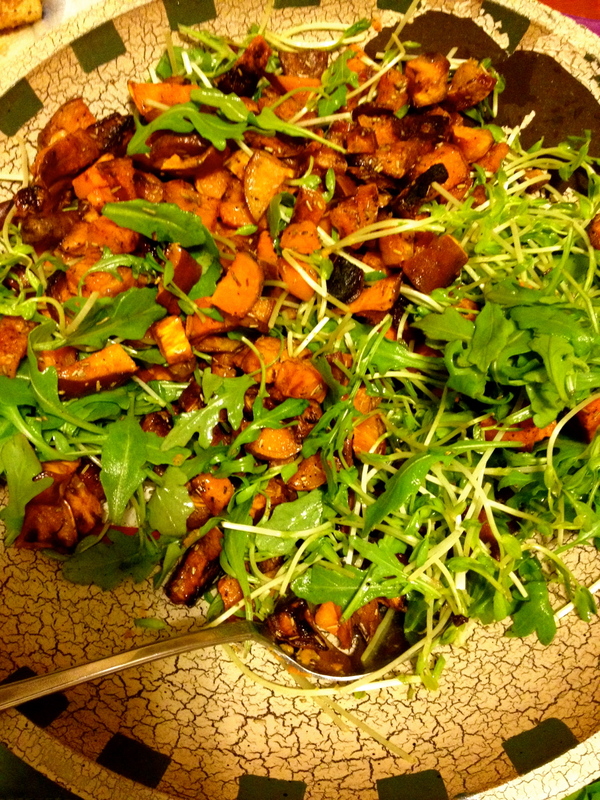 Place arugula, pea shoots and watercress in a salad bowl and mix together. Place roast sweet potatoes on the top of the salad. Drizzle over 1 tablespoon of balsamic vinegar (to taste). great recipe, I’m glad I found your blog! Thanks! Happy to connect with you here!